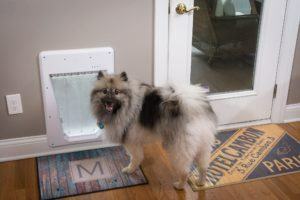 Pets and Remodeling: Manage Your Pet's Stress - J.S. Brown & Co.
Before you take on any remodeling project, first determine if you and your pet are up for the stress. Your home is also your pet’s home, so they need to be a big part of the planning of every renovation project. Pet stress can make an already difficult time more stressful for homeowners, which always translates to more stress for your remodeler. There will be a lot of different people in and out of the house over an extended period of time. There will also be noise, dust, strange smells, and open doors. Not to mention that the familiar home will be forever changed when all is complete. Make sure you can offer your pet a safe and quiet place in the house to rest during construction. 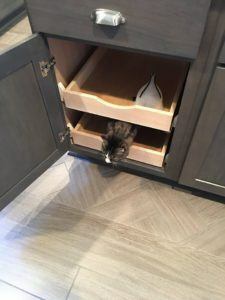 Keep your pet’s favorite things in this area as it will become their safe haven. Keep water, bed or crate, toys, and treats in this room. Communicate your plan of care with your construction team in a pre-construction meeting and have signs made to remind the construction team which doors to keep closed. Introduce your pet to the construction team and allow your project manager and his crew to socialize frequently to put your pet at ease with these new strangers. Your body language will have a lot to do with how well your pet adjusts, so show your remodeler some love. Put a towel or protective barrier at the base of any doors into your pet’s room to limit dust or strong odors that occur during construction. Dust can penetrate the air of rooms where construction isn’t happening simply due to air movement when doors are opened and closed. Construction dust can cause serious risk to exotic fish if not properly protected. Many pets are sensitive to loud and different noises. Playing music, TV/radio, or investing in a white noise machine can help drown out construction noise. It is always best to close the construction site off from pet access entirely, but this isn’t always possible, and pets are curious. At the end of each day, check for construction debris that could be harmful to your pet. Your remodeler will do everything they can to limit debris, but remember that it is a construction site and debris should be expected, so look closely for nails, staples, demolition debris, or sharp tools that may be exposed. Families love their pets as much as their human counterparts, so be sure to include them in your plans so they enjoy the remodel as much as you will! With further questions about how J.S. Brown & Co. can put you at ease during your remodel, contact us at (614) 291-6876.